This story is just too cool not to share with everyone. 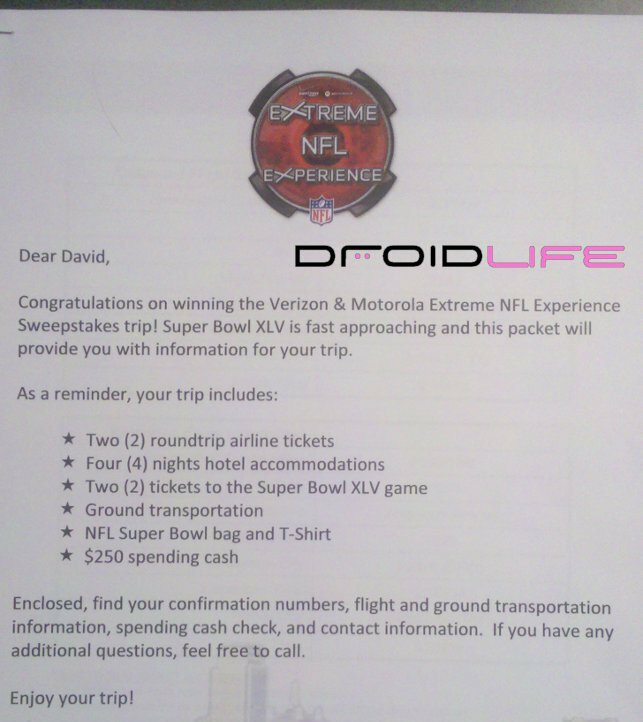 Do you all remember Verizon’s Extreme NFL Experience contest that we wrote about back in November? You know, the one that would send 2 people to Super Bowl XLV in Dallas for 4 nights, give them round trip tickets, game tickets, ground transportation, $250 in spending cash and a bunch of swag? A Droid Life reader won it! David from Pittsburgh texted from his Droid just as the contest had asked and will now take his son down to Texas to enjoy this year’s Super Bowl. Fitting that they are from Pittsburgh and that they are huge sports fans, right? Congrats guys! And have a blast! And to brag for just a moment, that puts the Droid Life winner total up to at least 7 or 8 I think. We’ve had multiple Droid X scavenger hunt winners, multiple R2-D2 hunt winners, a Galaxy Tab contest winner, an awards show winner, and now this. I guess reading DL pays off?